7570. Ruth SMITH (Hazel Alice JAMES , Guy Marvin JAMES , Alice Martha LOONEY , Luisa Ann BITLER , Daniel , John , Johannes ). Ruth married Stewart J BRAHS. + 13153 F i [Female] BRAHS. 13154 F ii [Female] BRAHS. 7571. Murle SMITH (Hazel Alice JAMES , Guy Marvin JAMES , Alice Martha LOONEY , Luisa Ann BITLER , Daniel , John , Johannes ). 13155 F i [Female] WHITTEN. 7572. [Female] SCOTT (Viola Harriet JAMES , Guy Marvin JAMES , Alice Martha LOONEY , Luisa Ann BITLER , Daniel , John , Johannes ). 13156 M i [Male] SWOPE. 13157 F ii [Female] SWOPE. 13158 F iii [Female] SWOPE. 13159 F iv [Female] SWOPE. 13160 M v [Male] SWOPE. 7573. [Female] SCOTT (Viola Harriet JAMES , Guy Marvin JAMES , Alice Martha LOONEY , Luisa Ann BITLER , Daniel , John , Johannes ). 13161 M i [Male] STOLL. 13162 M ii [Male] STOLL. 13163 F iii [Female] STOLL. 13164 M iv [Male] STOLL. 7574. Louise Ann TICKNOR (Dorothy May JAMES , Guy Marvin JAMES , Alice Martha LOONEY , Luisa Ann BITLER , Daniel , John , Johannes ). Louise also married Samuel Dean PRICHARD. Samuel was born in 1939. He died in 2006. 13165 M i [Male] PRICHARD. Louise also married Virgil Ralph MARLOW. The marriage ended in divorce. Virgil was born on 19 Sep 1929 in Medula, Polk Co, FL. He died on 2 Aug 1985 in Sarasota, Sarasota Co, FL. 7575. Diane JAMES (Marvin Guy JAMES , Guy Marvin JAMES , Alice Martha LOONEY , Luisa Ann BITLER , Daniel , John , Johannes ). 13166 M i [Male] JENKS. + 13167 F ii Tamara JENKS. + 13168 F iii [Female] JENKS. + 13169 M iv [Male] JENKS. Dennis James JENKS 1 was born on 5 Dec 1958 in Cleveland, Cuyahoga Co, OH. He died on 26 Jan 1994 in Mentor, Lake Co, OH. Dennis was issued a social security number . 7576. Donna JAMES (Marvin Guy JAMES , Guy Marvin JAMES , Alice Martha LOONEY , Luisa Ann BITLER , Daniel , John , Johannes ). + 13171 M i [Male] HERRON. + 13172 F ii Jacquelyn HERRON. + 13173 F iii Brenda HERRON. + 13174 M iv [Male] HERRON. + 13175 M v [Male] HERRON. + 13176 F vi Nora June HERRON. 7580. Pearl E MATHESIUS [scrapbook] 1 (Hope A TOWER , Sarah Estelle BITLER , Sylvester VanTress , Daniel , Daniel , John , Johannes ) was born on 8 Jan 1916 in Mendota, LaSalle Co, IL. She died on 22 Oct 2008 in Pine Acres Rehab & Living Center, DeKalb, DeKalb Co, IL. Pearl resided in 1917 in Mendota, La Salle Co., IL. She resided in 1930 in 1800 St Augustine St, Mendota, IL. She worked as Homemaker. She was a member of First Evangelical Lutheran Church in Lee, IL. She was a member of DeKalb County Home Extention program. Pearl married Hilbert LARSEN 1 on 4 Sep 1935 in Mendota, LaSalle Co, IL. Hilbert was born on 19 Mar 1908. He died on 11 Jan 1982 in DeKalb, DeKalb, IL. Hilbert was issued a social security number in 1955/1957 in IL. He resided in 1982 in DeKalb Co, De Kalb Co, IL. + 13177 F i Lois Anne Iva LARSEN. + 13178 F ii Hope Marie LARSEN. + 13179 F iii Joyce Elaine LARSEN. + 13180 M iv William Michael LARSEN was born on 1 Feb 1943. He died on 26 Nov 1970. Pearl also married Roy W IVERSON 1 on 26 Jun 1988 in Lee, IL. Roy was born on 30 Jul 1916. He died on 17 Sep 1991 in IL. Roy was issued a social security number before 1951 in IL. 7584. Keith Travers TOWER 1, 2 (Tracey Travers TOWER , Sarah Estelle BITLER , Sylvester VanTress , Daniel , Daniel , John , Johannes ) was born on 19 Nov 1921 in Sublette, Lee Co, IL. He died on 8 Aug 1990 in Chandler, Maricopa Co, AZ. Keith resided in 1930 in Mendota, LaSalle Co, IL. He worked as Director of Data PRocessing. He was issued a social security number before 1951 in IL. Keith married Loretta Ann CHAMBERS. + 13181 F i [Female] TOWER. 13182 F ii [Female] TOWER. 13183 F iii [Female] TOWER. 13184 M iv [Male] TOWER. 13185 M v [Male] TOWER. 13186 M vi [Male] TOWER. William Keith TOWER 1 was born on 1 Oct 1942 in Mendota, LaSalle Co, IL. He died on 2 Oct 1942 in Mendota, LaSalle Co, IL. 7586. Marijan TOWER 1, 2, 3 (Tracey Travers TOWER , Sarah Estelle BITLER , Sylvester VanTress , Daniel , Daniel , John , Johannes ) was born on 13 Jan 1924 in Mendota, LaSalle Co, IL. She died on 4 Jun 2008 in St. Francis Medical Center, Peoria, IL. She was buried in Restland Cemetery, Mendota, LaSalle Co, IL. Marijan resided in 1930 in Mendota, LaSalle Co, IL. She resided in May 2004 in Mendota, La Salle Co, IL. She was a member of First Presbyterian Church in Mendota, LaSalle Co, IL. Marijan married Elmer C EICH 1 on 27 Jun 1943 in Monterey, CA. Elmer was born on 21 May 1913. He died on 10 Jul 1992 in Mendota, La Salle Co, IL. Elmer was issued a social security number before 1951 in IL. He resided in Jul 1992 in Mendota, La Salle Co, IL. 13188 F i Joanne EICH. 13189 M ii Paul EICH. 13190 M iii Randall A EICH. 7590. John Roach "Joe" MINOR (Nelson N MINOR , Ica Belle BITLER , Sylvester VanTress , Daniel , Daniel , John , Johannes ). 13191 F i Leslie Lee MINOR. 13192 F ii Lori Ann MINOR. 13193 F iii Vicki Jo MINOR. 7592. Dorothy Louise "Dottie Lou" SULLIVAN [scrapbook] 1 (Dorothy MINOR , Ica Belle BITLER , Sylvester VanTress , Daniel , Daniel , John , Johannes ) was born on 14 Jul 1919 in OK. She died on 17 Sep 1987. She was buried in GAR Cemetery, Miami, Ottawa Co, OK.
Dottie Lou resided in 1930 in 218 G St, Miami, Ottawa Co, OK. She resided in 1935 in 223 W 12th St, Tulsa, Tulsa Co, OK. She resided in 1940 in 223 W 12th St, Tulsa, Tulsa Co, OK. She worked as stenographer with Oil Producers in 1940. Dottie Lou married Jacob Durward HESTER [scrapbook] 1. Jacob was born on 17 Aug 1917. He died on 24 Feb 1993. 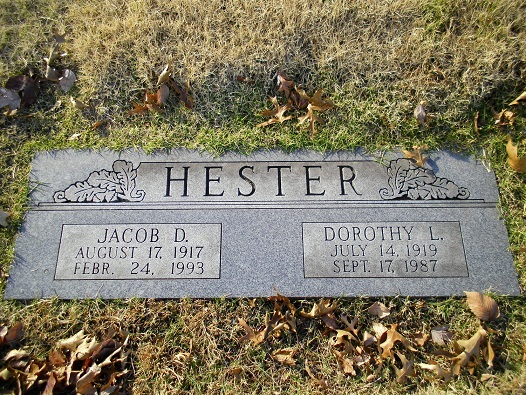 He was buried in GAR Cemetery, Miami, Ottawa Co, OK.
Jacob was issued a social security number before 1951 in OK.
13194 M i Ronnie HESTER.